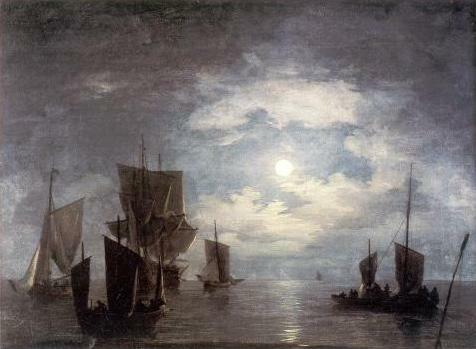 In Turner 1775-1851, a catalogue published in conjunction with a Tate Gallery exhibition 1974-75, the painting, right, is commented on as follows: "... a highly accomplished example of the tradition of moonlight scenes established by Claude Joseph Vernet, P.J.de Loutherberg, and Joseph Wright of Derby ..... 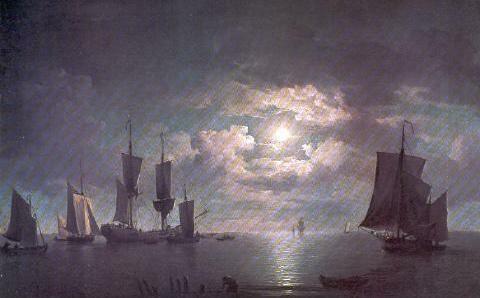 This rather intellectual, conceptual interest in light was to become a passionate obsession in Turner's later work". 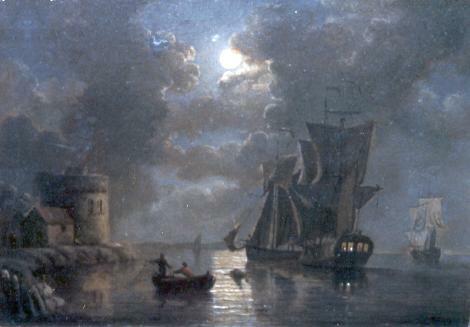 The evidence is that the "tradition of moonlight scenes", and the "intellectual, conceptual interest in light" were actually established by Peter Monamy in the 1720s, 50 years before Turner's birth, and just slightly pre-dating the work of Vernet, Loutherberg and Joseph Wright. 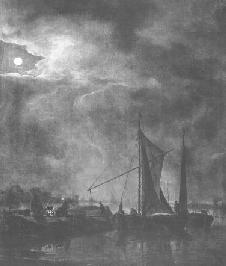 Nor is moonlight a theme of any significant interest to the van de Veldes. See here. Above is an Effet de Lune by Adrian Manglard, 1695-1760. 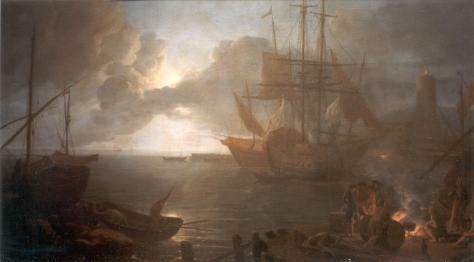 Fourteen years younger than Monamy, Manglard was a French painter who went to Italy, and became master to Vernet, 1714-1789. The group cooking on shore, lower right, somewhat recalls the Monamy painting dated 1723, see below and here. Presumably both are following earlier Dutch models, such as the example, right, by Hendrick Dubbels, 1621-1707, again with a group on shore. 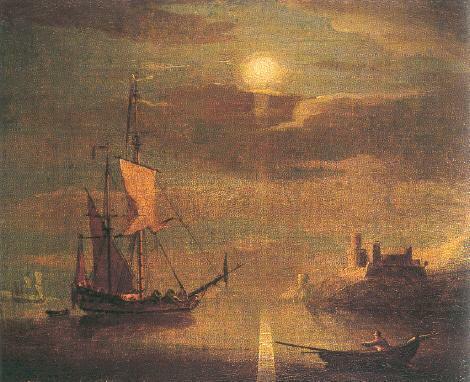 This painting is dated circa 1655 by Ulrike Middendorf, and is one of several versions she mentions, although only three moonlight scenes are included in her catalogue. Vertue's note makes it plain that it is a mistake to think Monamy never looked beyond van de Velde. The impression created by most English historians is that other marine painters were non-existent.